Police HQ flag at half mast in remembrance of former Chief Minister Bertrand Osborne. Her Excellency, the Governor (Ag), Lyndell Simpson has instructed all flags (Union Flag and Montserrat Flag) to be flown at half-mast in observance of the passing of former Chief Minister, Bertrand Osborne OBE OD. The flags around the Government Headquarters will remain at half-mast up to the end of the day of Mr. Osborne’s funeral, as a symbol on national mourning. The islands fifth Chief Minister died at his home on Tuesday, September 4 2018. Bertrand Osborne served as Chief Minister from 1996 to 1997. 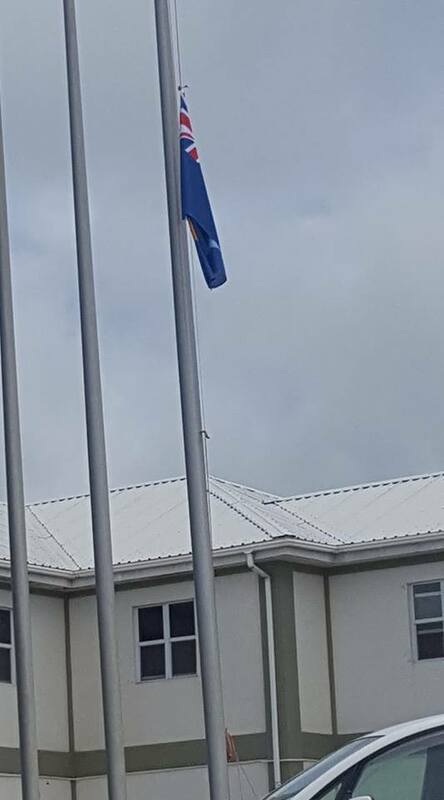 Half-masting of flags is a standard practice by the Government of Montserrat whenever the nation is mourning the loss of persons who have served Montserrat with distinction and at the highest levels. I am sorry to hear of the great loss of Former Chief Minister Osborne. My heart is heavy for his family and friends.